Arriving in Sweden’s capital by plane, train or car does not do it justice. 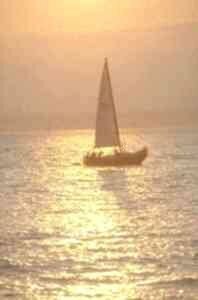 You must arrive by boat to see its true glory. Arriving in Sweden’s capital by plane, train or car does not do it justice. You must arrive by boat to see its true glory. Set on 14 main islands, at the confluence of Lake Mälar and the Baltic Sea, it is truly a shining jewel in shimmering blue waters. The freshwater lake is a couple of metres higher than the salty sea but as you walk around from Södermalm to Gamla Stan (the Old Town), and Riddarholm toward Norrmalm, it might go unnoticed apart from the locks (Slussen) and weirs. The building that draws your eye is Stadshuset (the City Hall). 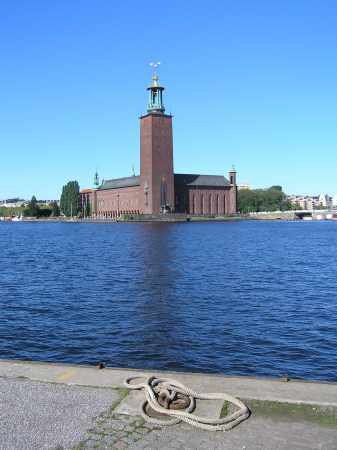 It stands proudly by the water’s edge with its tower topped by the three gold crowns (Tre Kronor) which represent the 3 kingdoms which combined to form Sweden. Indeed Ragnar Östberg’s building masterpiece reflects much symbolism and is often thought to be older than its years. It was opened in 1923. Today it is best known as the venue for the Nobel prizes ceremony and royal gala dinner held each December 10th (the date Nobel died in 1896). All but the Peace prize are awarded here. This is still a working office for the city’s council but the tour of the public rooms includes the Blue and Golden Halls — but all is not what it seems. The Blue Hall is not actually blue at all – it is red! No such misnomer for the Golden Hall, which is floor to ceiling gold leaf mosaic. It depicts various events and characters from the history and culture of Sweden. The centre piece is the personification of Stockholm sitting on Gamla Stan as Queen of the Mälar and being ‘worshipped’ by the western and eastern hemispheres. Outside at the foot of the Stadshuset tower is the tomb of Birger Jarl, the founder of Stockholm in 1252 — but his body is not there, it is in a monastery in Västergötland! Looking across the lake, Riddarholm kyrka (church) and Storkyrka (Big Church) on Gamla Stan frame the view. The iron work lattice tower of Riddarholm church is fascinating and intricate and changes as you view it from different angles. This church is not often open in my experience, but it is well worth a look inside if you are lucky enough to be there when it is. A six lane road divides Riddarholm from Gamla Stan. Fortunately there are various vehicular and pedestrian routes over and under it. Crossing from Birger Jarl’s Torg (Square) toward the Riksdag (Parliament) and Kungliga Slottet (the Royal Palace) you walk up the hill to Storkyrkan and into Stortorget (the Big Square). The grey and white 19th century building across the cobbled square behind the fountain is the first thing you see. Walk into the centre of the square and turn around to encounter its main attraction – a group of tall thin old, Dutch style elegant buildings in a range of colours – red, green brown, yellow ochre. There are few good places round Stortorget to refuel with tea and cake. Gamla Stan is a maze of narrow streets and alleyways lined mainly with old 4 to 6 storey buildings often painted ochre or white. You will encounter a statute of George and the Dragon. A painted version of the same can be viewed in Storkyrkan. The Royal Palace occupies the NE tranche of Gamla Stan. Built on the site of the original Tre Kronor palace, which burnt down in the 1600s, it is interesting to visit. Also the changing of the guard is held daily in the summer in the palace courtyard. Or, if you are there on 6th June, you can celebrate Sweden’s National Day and see the Royal Family. The national anthem is sung and no, it is not ‘Dancing Queen’! The 6th June was the date in 1523 that Gustav Vasa was elected King of Sweden, though only recently has the date become the National Day. Walking down the hill with the palace to your left you are looking over the sea to the Grand Hotel, Skeppsholmen (Ship Island) and Djurgården (Deer Park). Boats ply across between the islands; Af Chapman, moored off Skeppsholmen, being the exception (it is a youth hostel). 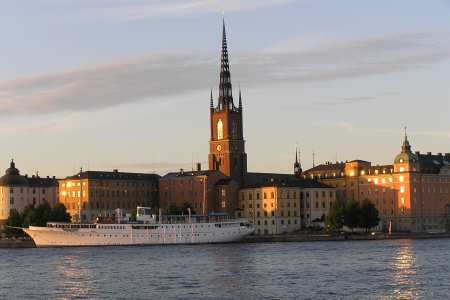 Take the ferry boat to Djurgården and arrive on Stockholm’s island of fun and leisure. It used to be the Royal Deer Park but today is home to among other things: Gröna Lund funfair; Skansen, the world’s oldest outdoor museum of buildings and which includes a zoo of Nordic animals; the Nordiska Museet and Wasa Museet (museums). Skansen is well worth a visit for a potted cultural history of Sweden region by region. Beyond Skansen the parkland is far more in evidence and you can do a country walk in the middle of the city! Or if you prefer you can fish or swim in the centre of the city in summer, or ice skate in winter. My personal favourite is the Wasa Museet, which houses a 17th century war ship which sank on its maiden voyage having only gone from Gamla Stan to Djurgården. The ship itself is the centre piece. The museum provides a fascinating and interactive insight into Swedish life at that time. Also the museum restaurant is very good. Crossing Djurgården’s bridge, take the bus to Kaknästornet (Kaknäs tower) and then ride the lift to the top to get fabulous views across the city from Lidingö to Långholmen. You really need to do this, as Stockholm’s inherent uniqueness is that, whilst it is a city, it does not feel like one. Heading back into the city centre and Hamngatan visit NK (the ‘Harrods’ of Stockholm). Greta Garbo was once a shop assistant there. Have a game of chess in Kungstradgården with the giant chess pieces. Then complete your visit with a trip to the Skybar in the hotel next to Central Station. Enjoy watching the summer sunset at around 11.30pm over arguably the world’s most stunning capital city — whilst sipping on your favourite drink. If you enjoyed reading the above article then you will probably also enjoy Oslo by Jane Dickman, and Normandy, also in Europe, and our latest articles covering the Orinoco Delta, La Mata, Marbella and Beijing.